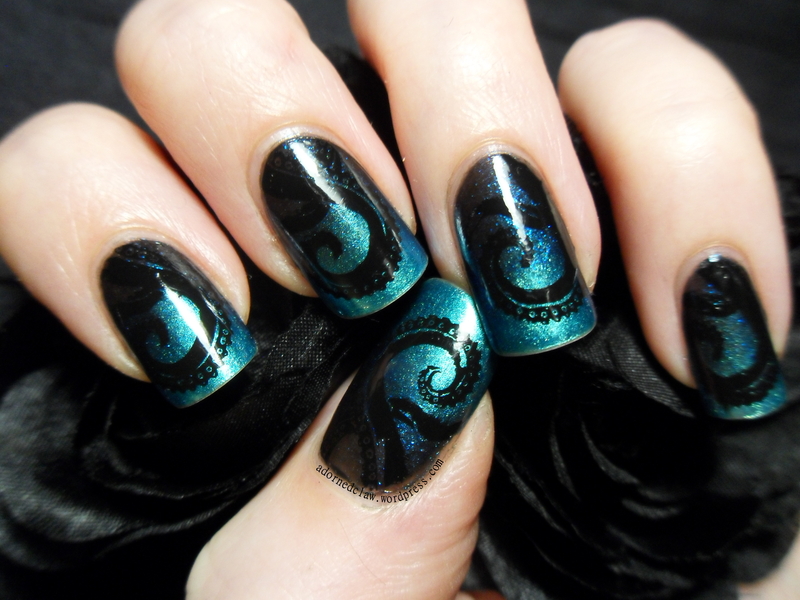 Slightly Steampunk Tentacle Nail Art! 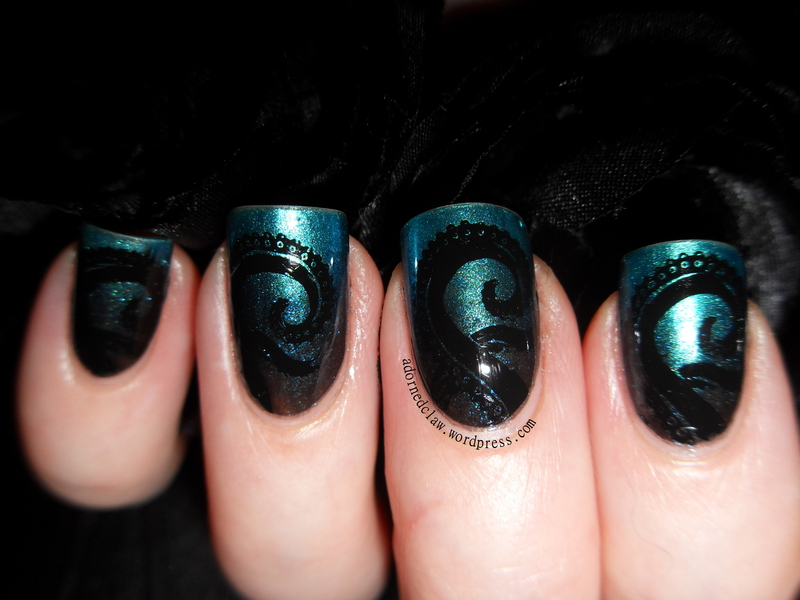 For this I started with a sponged gradient of Blackened Bleu a black jelly with blue and green glitter from Barielle Shades, Ciao Bella which is the dark blue shimmer with blue glitter and Gorgeous a teal metallic both from Sinful colors. 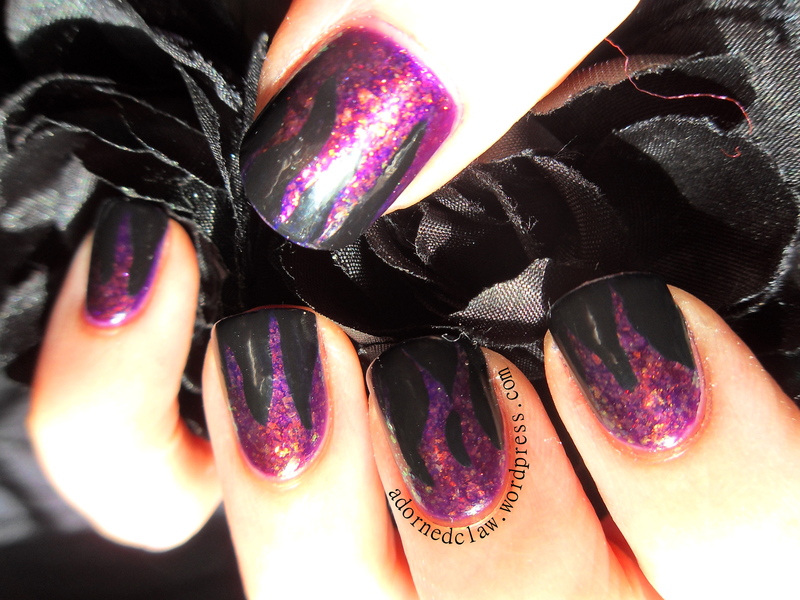 The stamping plate is BM-401 from Bundle Monster. Matte Sakura (Cherry Blossom) Nail Art. For this I started with a coat of Greige Gardens from Sally Hansen, when the first coat had dried I used the Greige Gardens and Amethyst from Sinfulcolors for the sponged gradient, this took three coats! The Cherry Blossom stamp is from Moyou Suki collection 02 I used Konad special polish for the image, One coat of Seche Vite to seal the image. Then when it had dried I applied my revitalized e.l.f. 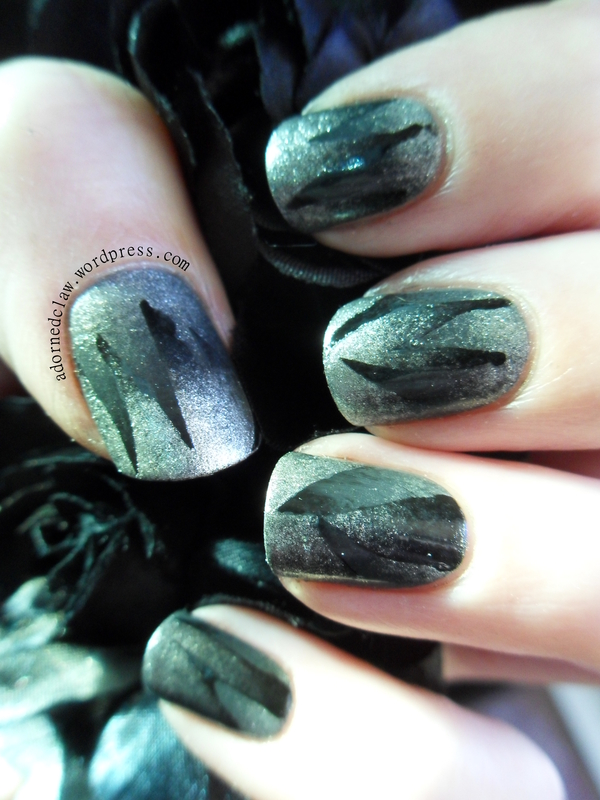 Matte topcoat. I had forgotten how scratchy the brush is in the matte topcoat so I ended up using one of my larger nail art brushes to apply it. 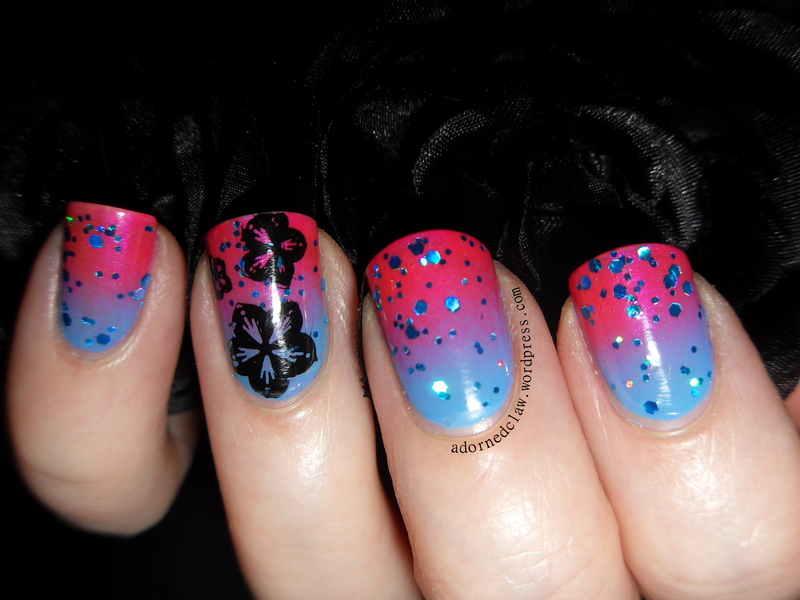 Girly Gradient Nail Art With Glitter and Flowers! I started with a sponged gradient of Sinful colors Paradise which is a light blue creme and Daredevil the bright pink, then one thin coat of Ariel from Chit Chat, which is a blue holo glitter in a clear base. I used Konad SP in black for the flowers, the stamping plate is Moyou Suki collection 02 Then a coat of color club top coat. I’m really enjoying trying out new (to me) nail art techniques, I realized that by only doing nail stamping I was missing out on loads of other fun nail art stuff! So here is another first for me, Waterfall nails! 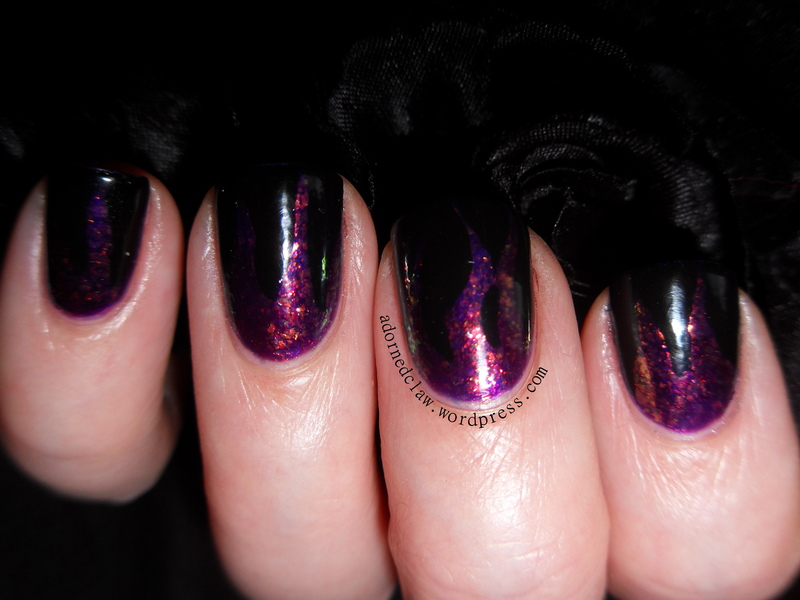 I used, Deborah Lippmann – Modern Love, Deborah Lippmann – Hit Me With Your Best shot, Sinfulcolors – Time Off, Illamasqua – Snap, Nails Inc – Old Bond Street, Barielle Shades – Night Moves and China glaze – Cosmic Dust. I started with a base colour of Modern Love from Deborah Lippmann, starting with the darkest colour using a fine brush, I painted on the stripes, making sure that each colour has stripes of different lengths.